When you’re on the go and looking for a quick breakfast, there’s no better choice than to start your day with a fresh bagel. Whether you enjoy yours with some smooth cream cheese, topped with lox or sandwich-style, our picks for the best bagel shops in the Sunshine State will not disappoint! With 13 homemade cream cheeses, a variety of fresh bagel options and quenching breakfast drinks, the Bagel Factory in Fort Myers always satisfies your hungry in the morning. Don’t worry if you’re a late riser, their tasty breakfast choices are served all day! 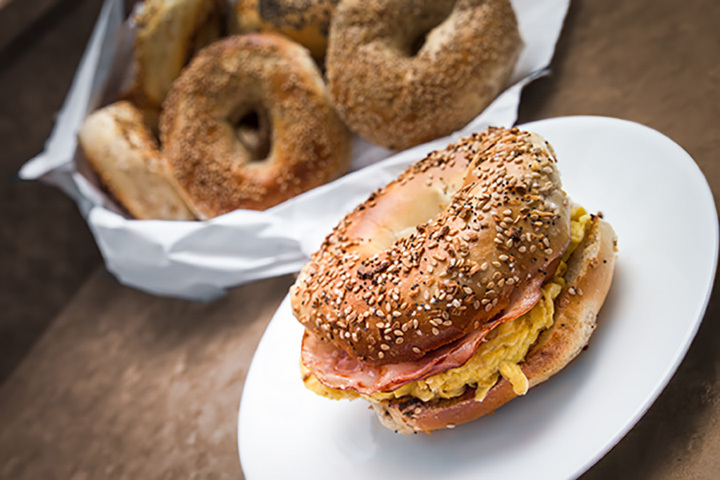 At this Casselberry bagel shop you’ll find 22 bagel flavors, New York-style pastries and more! With two Bagel King locations in Casselberry and Lake Mary, this spot has been serving Floridians some of the chewiest kettle-boiled bagels since 1977. Try the skinny egg white delight bagel sandwich for a healthier choice. This shop all started when an irritated New Yorker moved to the Naples area and couldn’t find a single decent bagel anywhere. Order a single bagel for breakfast or get some by the bag to take home and enjoy. Brandon Bagels and Deli is a hidden gem found in, you guessed it, Brandon! Their bagel sandwiches are great for breakfast or lunch with an assortment of sandwich meats, eggs or lox to choose from. The weekly specials at Bite A Bagel in St. Augustine make their bagel choices that much better! Customize your breakfast with a spread or toppings and remember to come in between 1-2 p.m. to get half-off a baker’s dozen any day of the week. High-quality ingredients are the top priority at this Miami based bagel spot. Their hand-sliced, smoked lox and nova is some of the best in the entire state. Don’t leave without giving it a try! This New York-style market and eatery has two locations in Boca Raton and Delray Beach. If you’re looking for a quick bite before heading to the beach in the morning, try a bagel topped with their delicious cinnamon hazelnut tofu spread. Each day the bakers at Fresh Bagels and More in Fort Myers create their wonderful bagels completely from scratch. The owners are from New York so you know their breakfast choices are authentic. All three St. Pete Bagel Co. locations will blow you away with how flavorsome their bagels are. Pair one of their fresh baked selections with a cup of their house-brewed coffee or espresso drinks. Proudly known as Martin County’s only bagel shop with bagels kettle-boiled and baked in a genuine stone oven, it’s no surprise they recently expended and opened a new location! Order one of their party platters to “wow” your coworkers at the office.